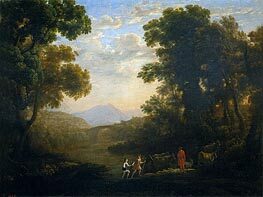 Claude Lorrain - "Landscape with the Finding of Moses"
Painted in about 1638, certainly by Claude's own hand, it was bought with eight others from the artist by Philip IV. 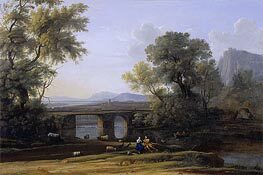 As is generally the case with his landscapes, the figures were accessories requested by the client, and were added by other artists to a picture which was conceived as a pure landscape. 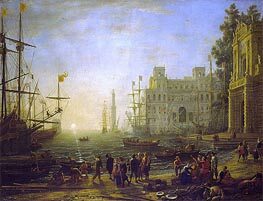 A Frenchman in Rome, first associated with Tassi, Breenbergh and Bril, then with Poussin, Dequesnoy, Sandrart and Pieter van Laer, Claude, from his first beginnings until the years of his fame, followed an independent course. 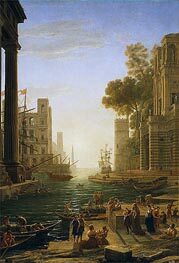 He made a single-minded communion with nature - not always faithfully reproduced, in fact often interpreted fantastically - at times associated with dreams of remote, fabulous antiquity, and with scenes of palaces drenched in light, of temples, ruins and seaports lit up by the rising or the setting sun. Claude repeated this landscape, but with a different illumination between the intersecting masses of trees. Here there is a sparkling sheet of water beyond the waterfall, and beyond it extends the aqueduct towards the valley and Mount Soracte, in a haze of silvery veils under the wide, sunny sky. The lyrical devotion of these landscapes engrosses one in a contemplation where every consideration gives way to that of the root identity of man vis-a-vis nature. From this point of view, Claude went beyond genre in both the rustic, country-style or hunting mode and in the staging of sacred or mythological scenes - which he retained only for clients bound to literary and rhetorical themes. As an artist he was responsible for a new concept, that of the exclusive and independent choice of one's own conditions of expression. The solitary landscape, with its inviting trees and hills, with its intimate aspect of a world that can open up at any moment and at every step, is the hero of his art. We do not frame our oil painting reproductions. Hand-Painted Art Reproduction is an expensive product, and the risks of damaging a painting stretched on a frame during transportation are too high. 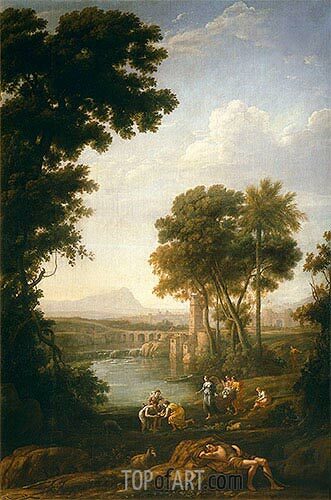 Moses Saved from the Waters of the Nile by Claude Lorrain is, therefore, not framed, and will be sent to you rolled up and packaged in a strong and secure postal tube. Your Moses Saved from the Waters of the Nile Canvas Print is individually hand-made, using sophisticated digital technology. The process of Giclée print technology imparts to the Art Print a vivid clear color, an incredible level of detail, and the authentic charm as from a museum original. The unframed print of Moses Saved from the Waters of the Nile will be shipped rolled up in a postal tube. The framed Canvas Print will travel packaged in a cardboard box with additional corner protectors.